The Tories have already cut doctors, nurses, student nurses and 15,000 beds. Now the government intends a further £22 billion of cuts through its 'sustainability and transformation plans' (STPs). 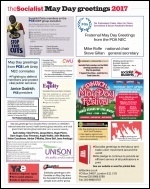 May Day greetings final push: We're really pleased we achieved our regional target this year for May Day greetings from trade union bodies, student groups and local campaigns. If you haven't yet, you still can! Around 30 striking workers and their supporters gathered outside Hackney Picturehouse on 31 March for a three-hour protest and picket. This marked the sixteenth strike organised by these workers since October 2016. Unite union members working in Bromley libraries began the first of eight days of strike action on 1 April. The long-running dispute is in defence of the library service from privatisation. Rents up 40% - can't pay, will stay! 'Keyworker' tenants of the housing association One Housing in Newham, east London, have been hit by a 40% price hike. Which association has the most overpaid chief executive? The worst record on maintenance? The poorest relationship with its staff? The recently formed Housing Associations Workers and Residents Network (HAWRN) has announced an 'alternative' housing awards ceremony. On 31 March campaigners internationally, spearheaded by the CWI, demanded justice for former Total/G4S workers in Yemen. As the Socialist (see issue 941) has previously reported, these giant corporations have washed their hands of responsibility for their former workers' unpaid wages and compensation. Placards from Huddersfield and Lincolnshire joined students, doctors and nurses in filling up Leeds on 1 April, writes Tanis Belsham-Wray, Leeds Socialist Party. What kind of people would build a hospital children's ward with a firewall which stopped just above a false ceiling, allowing smoke and flames to spread? And keep these and other dangers hidden from the staff, patients and even management of the hospital? 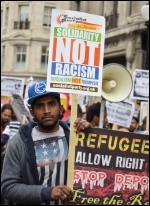 Socialist Party members throughout England and Wales are out campaigning in support of Trade Unionist and Socialist Coalition (TUSC) candidates standing in local and mayoral elections. We are appealing to all readers and supporters of the Socialist to make a donation to help support those candidates. Management at Solent University is rattled and failing to cover up its plans for extensive cuts and redundancies. Already staff in the UCU and Unison unions have voted 92% in favour of 'no confidence' in the vice-chancellor, who is paid £300,000 a year. Four police officers and one police community support officer are to face misconduct hearings relating to the 'freedom ride' protest by pensioners and disabled people on 23 June 2014. Newham Community Cinema held a showing of Ken Loach's film 'I, Daniel Blake' on 8 April. On behalf of East London Socialist Party branch I was asked to introduce the film. King's College London Socialist Students held a 'wall of shame' at the university about the terrible conditions faced by students both in halls of residence and renting privately in London. It's one world for the super-rich, and another one for the rest of us including 'champagne buttons' and the 'tampon tax'. 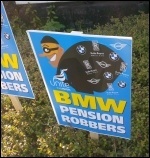 By a huge 93%, car workers at BMW, producing the Mini and Rolls-Royce, have voted to strike for eight days in defence of their final salary pension scheme. The ballot for the 2017 national executive committee (NEC) election of civil servants' union PCS opens on 20 April and closes 11 May. 50 PCS members walked out of the DWP administrative site at Annesley, Nottinghamshire for a lunchtime protest on 7 April. Fight for publicly owned green energy and transport: Thousands of kids across Britain are having their living conditions worsened and lives potentially shortened as they are exposed to illegal levels of air pollution. It's been a great first week for Steve Williams' Trade Unionist and Socialist Coalition (TUSC) campaign for mayor. 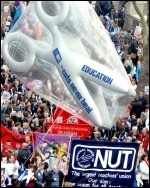 Following negotiations and a ballot of Unison members the Derby teaching assistants' dispute ended on 5 April. The members voted nine-to-one to accept the offer from Derby council. Artists and culture workers have backed calls for no-cuts council budgets, and cross-union campaigns against poverty pay and under-representation of oppressed groups. Changes to child tax credits and the 'Universal Credit' benefit system will mean that people making a new claim from 6 April will have the number of children they can claim for capped at two. One exception to this is if the third child was born as a result of what the government calls "non-consensual conception." Train strikes brought large parts of the country to a standstill on 8 April. Train guards in the RMT union struck against driver-only operation (DOO) on Merseyrail which affected the Grand National horse race, on Northern Rail and again on Southern Rail, days before the franchise's boss doubled his pay. 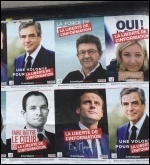 Old political elite discredited: In the forthcoming French presidential election Jean-Luc Mélenchon is closing the gap on the three frontrunners. The demonstration on 8 April was a great success. Domestic staff at the Royal London Hospital have had their victory over privateer bosses' attacks on their breaks confirmed, writes Socialist Party reporters. What kind of movement is needed to save our NHS? The life and death struggle for the future of the NHS, against the onslaught of cuts and privatisation, has now entered a new phase. Do you have something to say? Letters to the Socialist's editors. Poverty is pricey; term-time trips; Blairites' Syria scandal. TUSC council candidate vows never to go to the 'dark side'! The Socialist Party welcomes the re-election of Len McCluskey as General Secretary of Unite. His victory over Gerard Coyne is a defeat for the Tories and the capitalist establishment as well as the Blairites within Labour. "The dividing lines in this election could not be clearer", declared Jeremy Corbyn. "It is the establishment that complains I don't play by the rules: by which they mean their rules." Cuts are putting at least 11,000 mental health patients each year at greater risk of suicide because they are not promptly followed up after leaving in-patient care. Looking for an affordable home in east London? How about a caretaker's storeroom round the back of a poorhouse for £350,000? PCS Left Unity says get rid of the Tories! Theresa May's calling of a snap general election on the pretext of needing a mandate on Brexit is a sham. However, the election campaign gives an opportunity to expose and oppose her government's austerity programme and to get rid of the Tories. Tenants faced with a massive 40% rent hike by their housing association, One Housing, met on 24 April to pledge to fight it. The majority of the tenants, who live in West Ham, east London, are still paying the old rent via standing order and are campaigning for all tenants to do the same. In 2016 many changes were made within the big four supermarkets as they adapted to falling sales. The Coop, Sainsburys, Morrisons and Tesco all saw many store closures and thousands of jobs lost. French presidential election: Macron and Le Pen reach second round. Statement from Gauche Révolutionnaire, CWI in France.